Our group of five stood staring at each other. We really didn’t know how to respond to our guide. After a minute, I managed, “um, cheese?” After a few more seconds, “I think the beer is good,” said another of the participants. 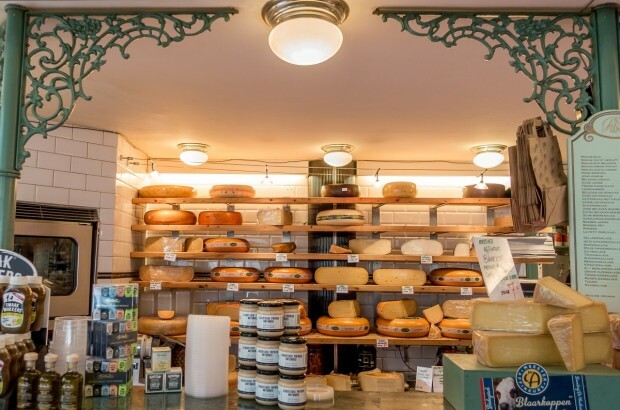 So at the beginning of our Eating Amsterdam food tour, the sum total of our group’s knowledge was beer and cheese. We had a long way to go. Luckily, we had eight stops and four hours ahead of us walking through the Jordaan neighborhood to get a bit smarter. Here are six of the things I learned along the way. Puffy pancakes (known as poffertjes in the Netherlands) are topped with an amazing combination of butter, powdered sugar, and maple syrup. It may sound like a lot of sweetness (that’s because it is), but it’s also heavenly. Something about the way the sugar melts into the syrup makes it impossible to stop eating these silver dollars of goodness. In the U.S., we think of pancakes primarily as a breakfast food. 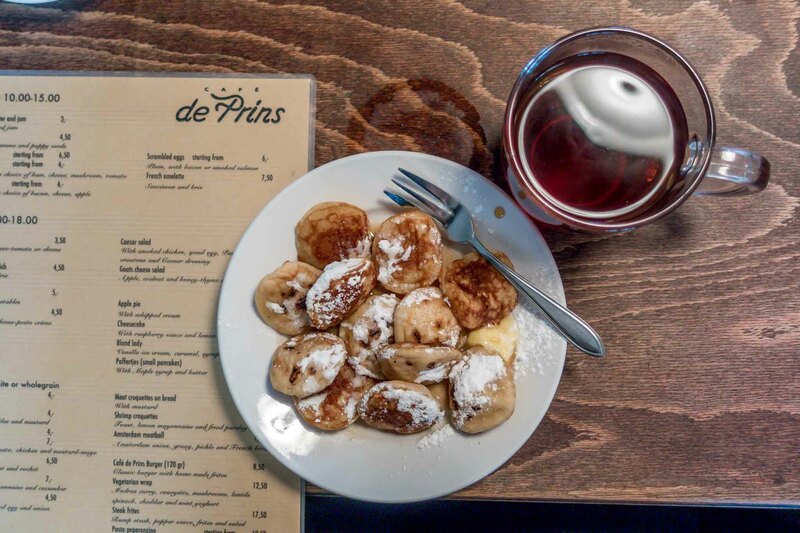 But the Dutch have it right – poffertjes are perfect at breakfast, but they’re also great as a snack, for dinner, or pretty much any other time. 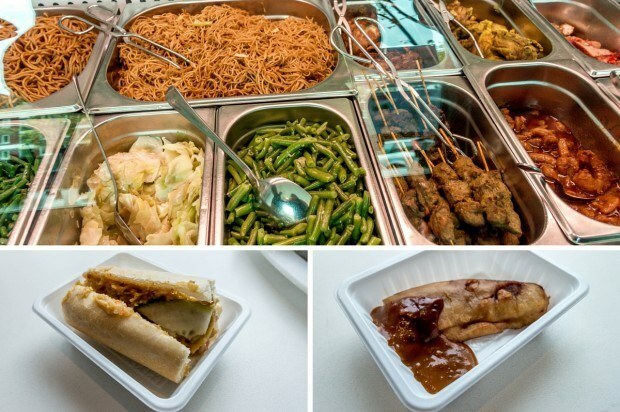 Some of the best food in Amsterdam isn’t actually Dutch – it’s Indonesian. Full of spices and savory, salty goodness. The Netherlands had a long (like, 350 years long) history as colonizers. When those colonies won their independence after World War II, many citizens made their way to the Netherlands in search of new opportunities. And, voilà, Amsterdam has reaped the rewards in the form of flavorful, fantastic Indonesian food. On the Eating Amsterdam food tour, we stopped at a Surinamese/Indonesian shop for two treats. The first was a broodje pom, a sandwich with a delicious combination of slow-baked chicken, chili, and a root vegetable called Malanga that’s similar to a potato. It was soft, tangy, super filling. The second dish was bakabana, a fried plantain with peanut sauce. A little bit sweet and a little bit savory, and a lot delicious. I’m kind of a sucker for peanut sauce. To say that I was not excited to try herring is an understatement. Our guide didn’t help when she told us a popular local saying – “If you haven’t tried herring here, you will regret it. 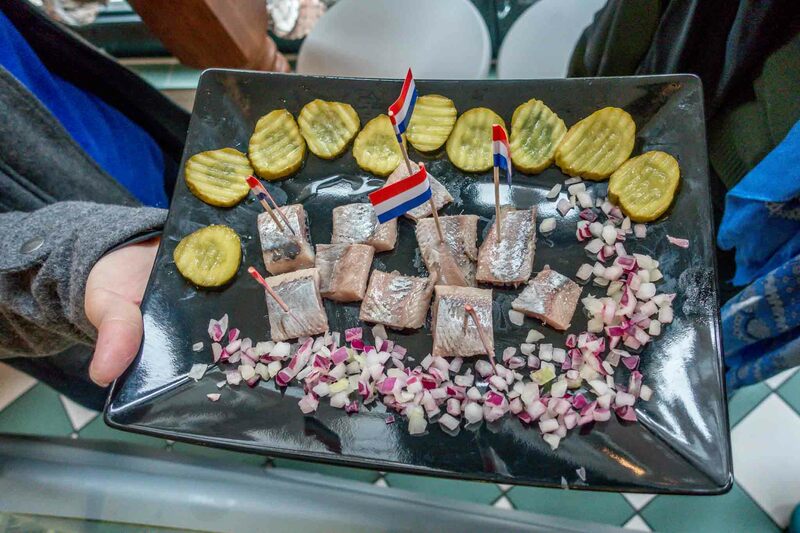 If you have tried herring here, you will regret it.” So, yes, my expectations were low. When the platter was presented to us – complete with red onions and pickles – I was not looking forward to it, but I felt like it was something I should try. So, I held my breath and dove in. You guys, herring is really not that bad. I was stunned by how light, fresh, and distinctly not-fishy-tasting it was. This definitely showed me that one of the benefits of a food tour is trying new things (in small quantities). As American as apple pie, huh? Not so fast. 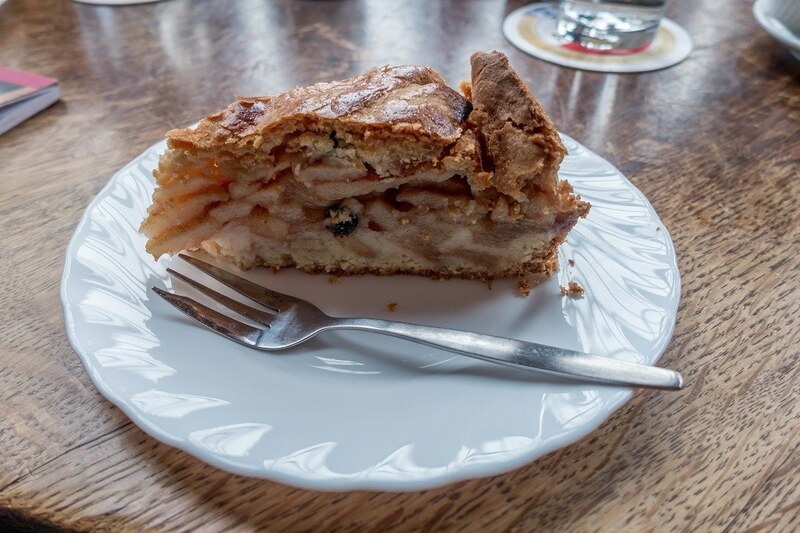 In the Netherlands, apple pie has been part of the regular menu for 500 years. Stacked thick with apples and surrounded by a firm crust, the Dutch apple pie was easily the most delicious thing I ate on the Eating Amsterdam food tour. It was laced with cinnamon and raisins and served with fresh whipped cream. So delicious. 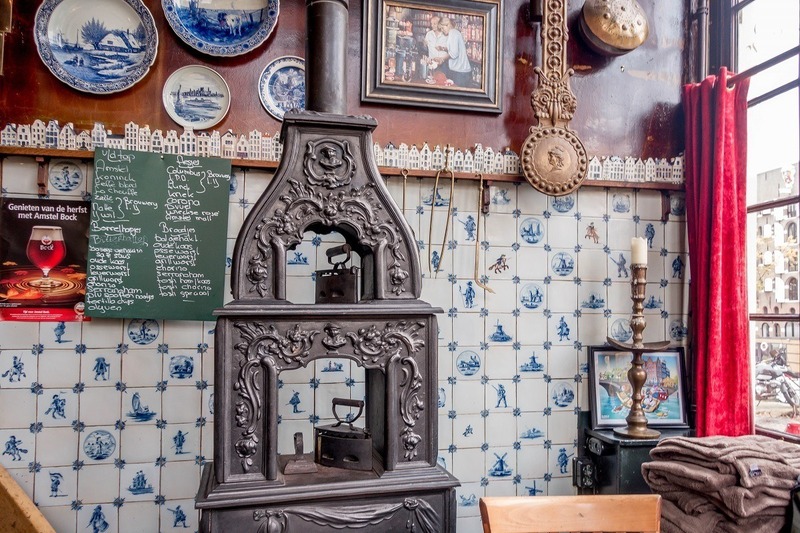 But what really pushed the experience over the edge was the setting – one of Amsterdam’s 400-year-old brown cafes. These traditional Dutch pubs are named for their dark wooden interiors, and many locals treat them like an extension of their living rooms. 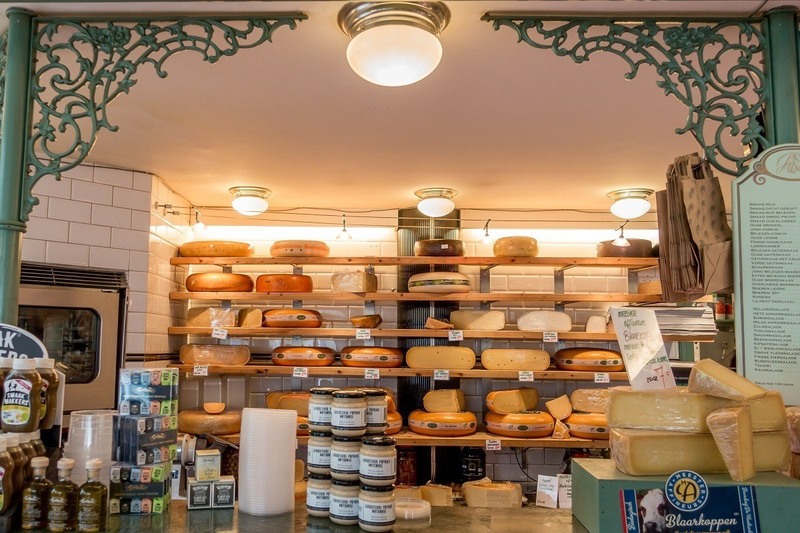 It really doesn’t get any more local or quintessentially, charmingly Dutch. Licorice is a Dutch favorite. 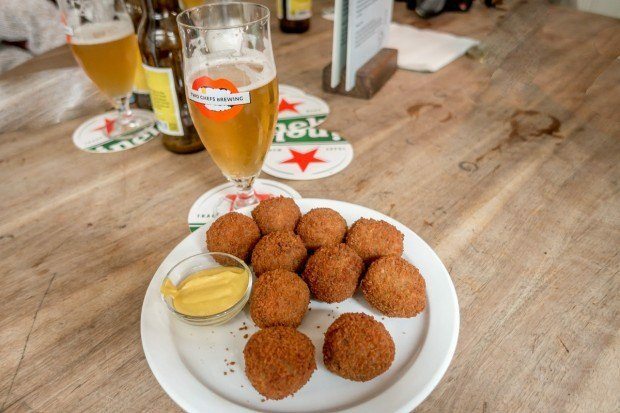 In fact, the average Dutch person eats 2 kilograms every year. It comes in hard and soft varieties. 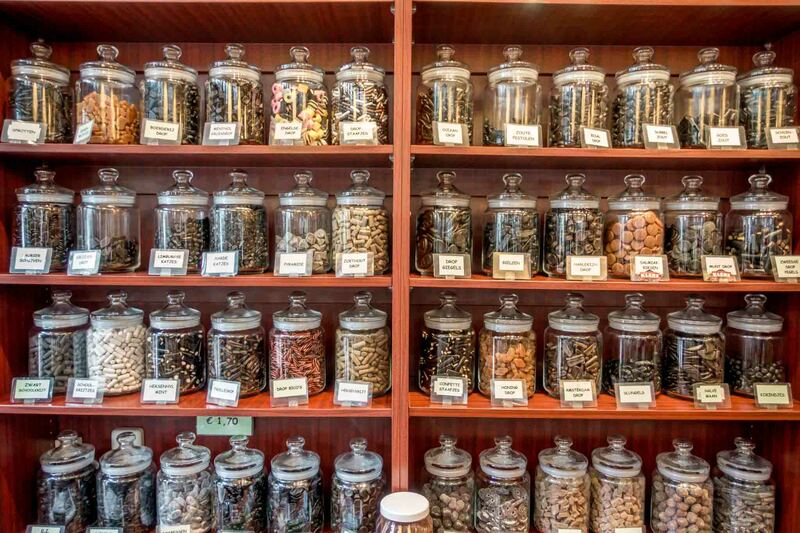 There are dozens of flavors, including traditional black with an anise-like taste, honey-flavored drops, and even a salty variety (just say “no”) – all of which you’ll get to try. But not red. The passionate candy store owner will leave no doubt in your mind that red isn’t real. My first introduction to beer snacks happened earlier this year with some amazing fried bread in the Baltics, but Amsterdam takes fried goodness even further with bitterballen. Bitterballen are breaded balls of what is essentially gravy that are deep fried and served up with mustard and your favorite drink. These bite-sized treats are great pretty much any time of the day or night. Good on their own, they’re pretty darn amazing with a frothy beverage. 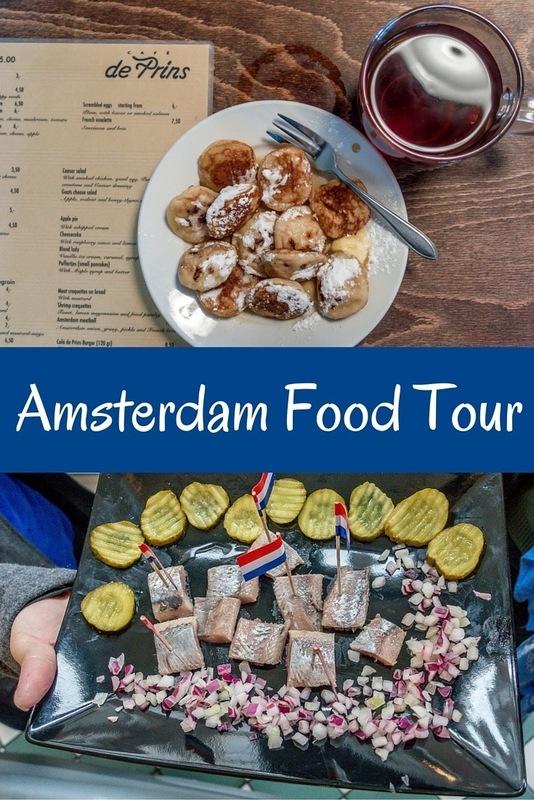 We were the guests of Eating Amsterdam. All opinions of the sugary, savory deliciousness are our own. Have you been to Amsterdam? What was your favorite food there?